Zurich, May 28th, 2013 – On 20 May 2013 Switzerland reached the first place in the global statistics of IPv6 user adoption due to the activation of over 500,000 IPv6 connections by Swisscom. The deployment of IPv6 has been planned carefully for some time, tested and finally integrated and will now be further pursued in all areas. The Swiss IPv6 Council welcomes this development and will report on it at the upcoming IPv6 Business Conference. The current situation of dwindling IPv4 address resources on the internet requires the ISPs and website operators to plan and implement the new IPv6 protocol. IPv6 is an essential prerequisite for unhindered growth of the Internet, particularly in the context of the "Internet of Things" and mobile services and devices. Thanks to the IPv6-enablement of over half a million home users by Swisscom, the IPv6 user share in Switzerland has increased more than tenfold since World IPv6 Launch Day on June 6, 2012, and is currently at over 10% (see Figure 1). This means that Switzerland is a pioneer in the introduction of IPv6 and is globally ranked first ahead of Romania (8%) and France (5%). 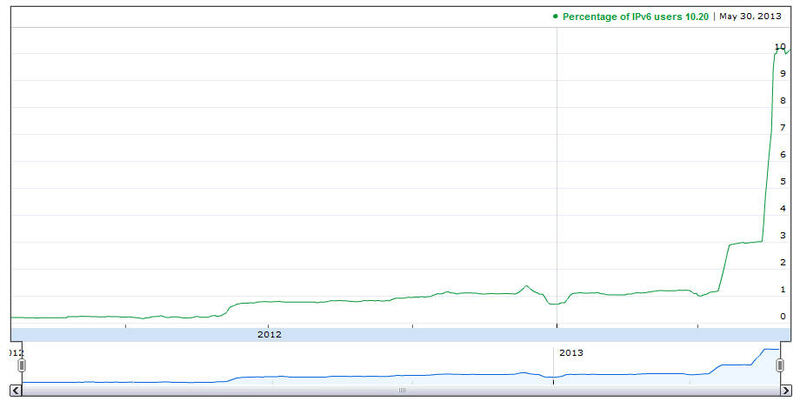 Globally, the percentage of IPv6 users is currently around 1.5%, up from 0.65% at World Launch Day a year ago. The graph clearly shows how the number of IPv6 users in Switzerland first rose at World IPv6 Launch Day in June 2012. At that time, Swisscom - as an active participant in the initiative - introduced the first users to IPv6. The increase from just 1% to the current 10.2% was achieved this year by the enablement of approximately 500,000 users in April and May. It will now be attractive for content providers in Switzerland to make their websites available over IPv6 (check our dashboard and register if you have a Swiss website). Users with so-called dual-stack connections, which can use both, IPv4 and IPv6, connect to IPv6-enabled websites usually with IPv6. This means that users with bad IPv4 connections (due to the increasing use of NATs because of address shortage) can access these sites via a performant IPv6 connection. The Swiss IPv6 Council, which aims to promote the introduction of IPv6 in Switzerland, is very happy about this development. The example with Swisscom shows that the move to IPv6 is feasible even in large masses. The development in Switzerland did not go unnoticed by the leading representatives of the international IPv6 global community. "Swisscom has been a pioneer in the support and deployment of IPv6 since the beginning. Achieving today the number 1 position in the world in the IPv6 penetration is a testimony of a front-runner in the Telecom world becoming exemplary in modernizing its Internet infrastructure and encouraging others to join this first and fundamental upgrade of the Internet and most probably the last one for decades to come," says Latif Ladid, President of the International IPv6 Forum, impressed by the Swiss development. The International IPv6 Forum brings together all national councils like the Swiss IPv6 Council to a global IPv6 Community. Swisscom is the main sponsor of the Swiss IPv6 Council since its beginning more than three years ago. On June 11, the Swiss IPv6 Council organizes an IPv6 Business Conference in Zurich, where IT decision makers, architects and engineers can get up-to-date information about the current state of IPv6 development as well as planning considerations, case studies and technical session. The conference features international experts like Moshe Rappoport, IBM Research, Gert Doering, RIPE Chair, and Silvia Hagen, IPv6 Essentials author of O'Reilly and President of the Swiss IPv6 Council. The global position of Switzerland as a leader in the integration of IPv6 motivates ICT manager to involve the introduction of IPv6 in their planning. The IPv6 Business Conference on June 11, 2013 provides the perfect opportunity to learn about the various aspects of an effective IPv6 integration and to meet and network with peers and speakers.